San Clemente's Sander Lush drives against Palos Verdes. The San Clemente Tritons have been the undisputed Kings of the South Coast League for the last two seasons. The two-time league champions have not lost a league game since 2015. If the streak is to continue, the Tritons will have to get it done without the 18 members of the class of 2017. The mass exodus of last year’s senior creates both opportunities and challenges for head coach Brendan Finnerty and the Tritons. The talented class of 2017 dominated playing time, and with their departure a new generation of Tritons will have the opportunity to show that they are ready to play. One of the challenges associated with the turnover is that last season Finnerty was able to coach comfortable in the knowledge that he had a core group of seniors who from years of playing together knew their roles and responsibilities. This year will be different. 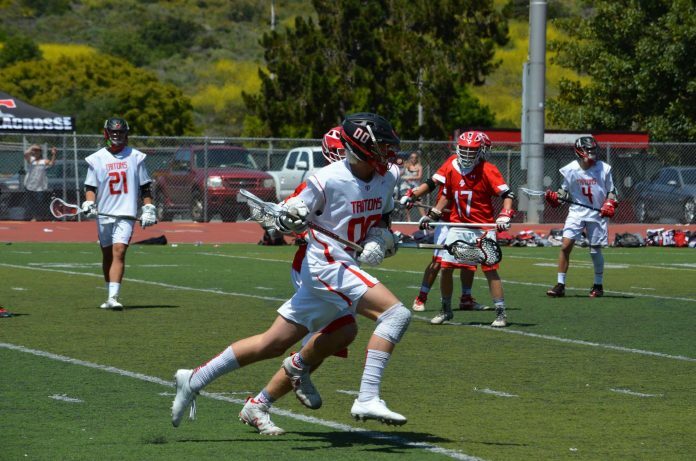 With athletes like attackman Branden Wilson, midfielder Jake Brannon, and defenseman Nick Amico and Dylan Hartanov returning, the 2018 San Clemente will not be lacking for talent, and if this team continues to gel as the season progresses, the Tritons may peak at just the right time.